Technology CSS | Location Running. Chirp Spread Spectrum (CSS) is a customized application of MDMA for the requirements of battery–powered applications, where the reliability of the transmission as well as low power consumption are of special importance. CSS forms the basis of the nanoLOC TRX Transceiver which was developed for medium data rate applications. CSS consists of Chirp pulses, an Upchirp and a Downchip, as illustrated. CSS operates in the 2.45 GHz ISM band and achieves a maximum data rate of 2 Mbps. Each symbol is transmitted with a chirp pulse that has a bandwidth of 80 MHz (an effective bandwidth of 64 MHz is the result of a selected roll-off factor of 0.25) and a fixed duration of 1 µs. The system gain of CSS is 17 dB. Chirp pulses are used in nature by Dolphins and Bats. These pulses were first patented for radar applications during 1940 by Prof. Hüttmann, and was further developed by Sidney Darlington (Lifetime IEEE Fellow) in 1947 (Pulse Compression Radar). During the mid 1990s Canon patented chirp pulses for data transmission in fiber optic systems. Since 1996, CSS for commercial wireless data transmission was investigated and patented by nanotron Technologies. Because it uses broadband chirp pulses, CSS is very resistant against disturbances. 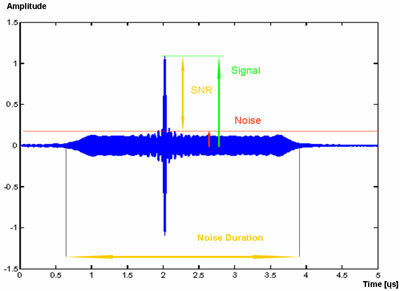 Click here to view a diagram showing the effect of narrowband noise with a signal-to-noise ratio (SNR) of 0 dB. The signal is reinforced by the dispersive delay line (DDL) while the disturbances contribute only as basic noise (system gain). Therefore, CSS is very resistant against narrowband noise. CSS is resistant even against broadband disturbances. 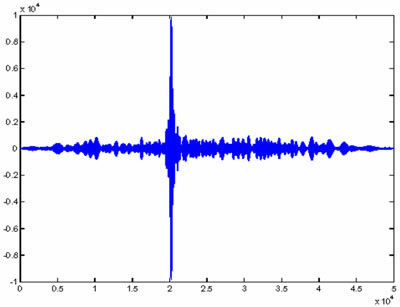 The diagram below shows the effects of broadband disturbances at SNR of 0 dB. The DLL effects a significant reduction of the noise with respect to the signal. With this, CSS is most suitable for the highly used ISM band where interference from other communication services and microwave ovens create massive disturbances. Another significant advantage of CSS is its robustness against multipath fading. The original signal from the transmitter reaches the receiver with several echoes and reflections from buildings and other environmental surroundings due to multipath propagation. The reflections reach the receiver in or out of phase. Some frequencies will be amplified or attenuated depending on the conditions. This leads to a disconnection of the communication link of narrowband transmission systems. CSS is different, however, in that the amplified and attenuated signals are in balance because all energy shares (which are spread over the bandwidth of 80 MHz) are collected (integrated broadband technique).